Washington, D.C.— The Institute of Museum and Library Services (IMLS) has released the latest report (PDF, 16MB) on the State Library Administrative Agencies (SLAA) Survey. The biennial survey, conducted in FY 2016, assesses the condition of SLAAs in all 50 states and the District of Columbia. The IMLS report found that SLAAs experienced significant decreases in revenues and staffing during the economic recession from 2007 to 2009, with no sustained gains afterward. 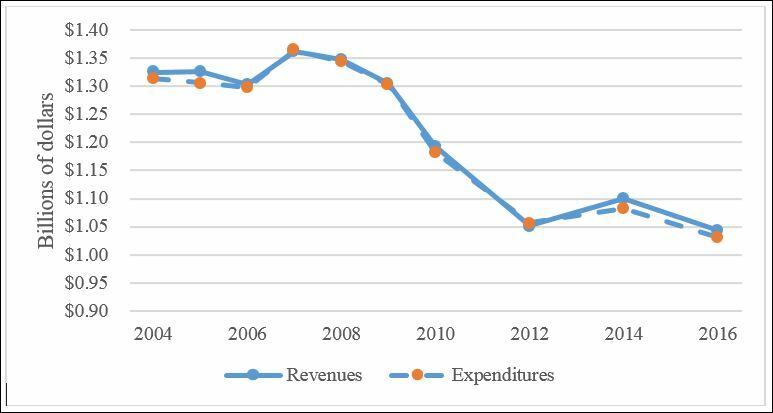 The survey found that over the past 12 years, SLAA revenues declined by over a fifth, while expenditures fell in parallel by 22 percent. Most of this decline occurred between the onset of the economic recession in December 2007 and its end in June 2009. However, SLAAs funded by their state’s department of education had much higher revenues and expenditures in comparison to other libraries funded through other administrative structures. However, despite decreased revenue, 31 SLAAs reported providing statewide reading programs, an increase from 61 to 86 percent over two years. Additional services offered by SLAAs remained relatively unchanged. Forty-nine of the 51 SLAAs provided consulting services, most commonly for library management/organizational development, continuing education, and youth services. Thirty-nine SLAAs provided some form of literacy support. Source: State Library Administrative Agencies Survey, FY 2004–10, 2012, 2014, and 2016; Institute of Museum and Library Services; National Center for Education Statistics. In line with the decline in revenues, the survey found that the number of SLAA staff members declined by 24 percent over the past decade. In FY 2016, there were 2,633 full-time equivalent (FTE) positions across all SLAAs; most (49 percent) were in library services, followed by library development (20 percent), other services (17 percent), and administration (14 percent). SLAAs funded by departments of state or administration had the smallest percentage decline in staffing (14 percent) and those funded by departments of education had the largest decline in staffing (40 percent). Read the full report here (PDF, 16MB). The purpose of the SLAA survey is to provide state and federal policymakers, researchers, and other interested users with descriptive information about state library administrative agencies. The federal government has been collecting statistical data on SLAAs since 1994, and this report marks the seventh release of state library statistics from IMLS. It contains data on SLAAs in the 50 states and the District of Columbia for FY 2016. The data collection is a product of a cooperative effort among the Chief Officers of State Library Agencies, IMLS, and American Institutes for Research.